So, a funny thing happened to me at the fair today. No really, I’m not just quoting a line from a comedy bit. A lady was texting and drove her buggy into one of the main tent posts. Pause for effect. Now before you go wondering how I could derive comedy from what sounds like a tragic situation hear me out. The buggy was a front and back baby stroller. But the lady was indeed texting as she was walking through the tent. In perfect form which could only be described as something to watch over and over on YouTube, she blindly walked right into the tent post directly in front of our booth. Fortunately, no one was hurt, however, the little child riding in the front seat of the two-seater, promptly began crying as the impact shook both passengers and driver. The dialog that transpired after that between the mother and the father is not suitable for writing in this blog. Today, the crowd was tough. I mean T-U-F. I could have been giving away gold bars and people would have ignored me today. Not everyone treated like we were made of glass. I ran into a young lady who is an illustrator. She shared with me some of her digital portfolio which was impressive. The “cool factor” didn’t come till we were wrapping up for the day. She had reserved a copy of Guardian and jotted down her info on our memo pad. On it, she noted her address, Morgantown. I couldn’t believe it. How did I miss that? I also got a chance to meet a nice young lady who had went so far as to write several books in long hand, and then, regretfully, lost them. My heart went out to her as her premise had some very intricate layers. I encouraged her to take some time and begin again. Set aside a special place and fixed amount of uninterrupted time and just write. Stick to the routine so that her mind and her imagination gets use to the idea of going to work whenever she’s in that place/time. While the weather was unbearably hot, we made the most of it and had a pretty good time overall. I did make some new contacts. It looks like I may be planning some additional appearances in the near future. Stay posted for updates. Tomorrow, its back to work and by work I mean writing. 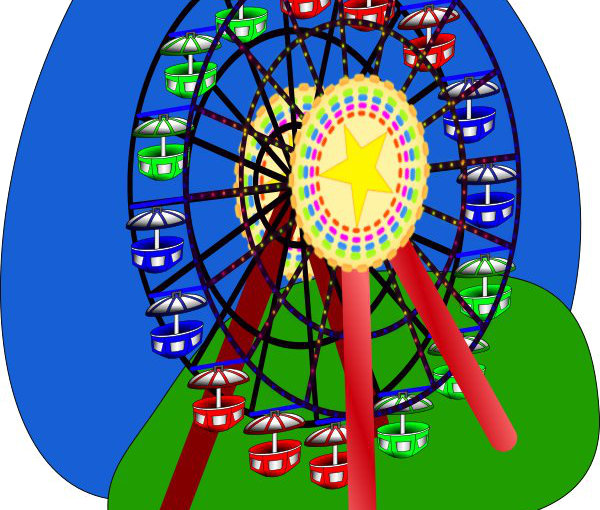 The fair has been a distraction for sure and now I need to get my writing back on schedule so that I can deliver book three by Christmas. I know I can do it. Thank you again to everyone who stopped by. 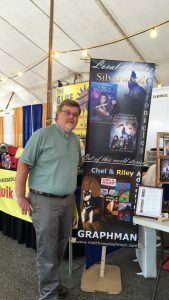 Thank you for reading this blog and supporting the Silverwood Chronicles and/or Chel & Riley. While I write because I enjoy it, its nice to have people enjoy what I write. 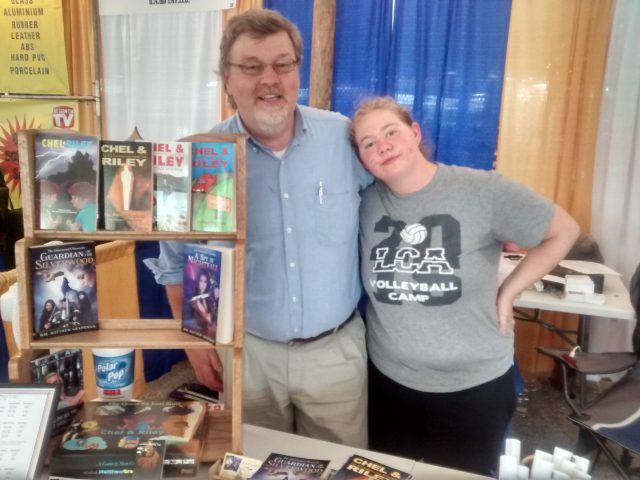 My Creative Consultant made her first appearance at the fair. Unfortunately, she was not able to stay long and meet many of you, but she is going to be around all day tomorrow and Saturday. Someone, please, find for me a statistic that proves that extreme heat causes a person to forget things. There has to be a statistic for this because I really want to believe its true. Is there something wrong with that? I only mention this because there were several times during my eight hour shift at the fair today that I tried to strike up a conversation with someone who had either been there on a previous day, or who had already been by earlier in the evening. Oh, but I did remember alma mater mom. Although after I said “Hi <x> mom”, I realized that I had missed X’s name slightly. It’s the heat! I know it and someone is going to give me a study that proves it. Right. Someone. Anyone. We got to visit with some old friends. I don’t mean they were old, necessarily, I mean that I had known them for a long time, but that it had been a while since I’d seen them. So, maybe that does make them old. If it does, it makes me old too. I did meet one young lady today that didn’t let me get past my opening description of the Guardian of the Silverwood book, before she had it in her hands and said I need to buy this. I honestly didn’t know how to respond. Don’t get me wrong, it was very cool and I was encouraged by it, but it really did knock me off balance for a second or two. I’ve already mentioned in the last couple of updates about aspiring new authors. Today I not only got to meet a woman who was working on a gargoyle series, but I also ran into a budding young filmmaker. It was very neat to talk with both of them and I wish them well in their endeavors. Tomorrow’s the big night — Friday. If you’ve been by and haven’t gotten your copy of Guardian yet, I’m down to 4 copies. I’m overwhelmed by the amount of support for series that I’ve received and I had no real expectation to sell as many as I have. If you happen to miss it tomorrow, I promise to hold over the Fair price including FREE shipping until I can get a new batch printed and delivered over the next week or two. Good night everyone. I look forward to seeing you all at the Fair! My mom just has to take my picture standing next to the booth. Really mom, don’t you have enough pictures of me! Today was family day, or so it seemed. My mom, my mom’s best friend, my mother in law and her husband all dropped by to encourage me and visit the fair. Really, I think they were there for the elephant ears or yummy rib eye steak sandwiches, but they told me they stopped by to see me. So many stories today I can’t possibly fit them all into this post. Well, I could, but I would be up until morning writing this post, and I really, really want to go to bed. My feet hurt like I’ve been at Disney World for a week. Probably the most exciting encounter today has to go to the young lady who is going to be a Junior at my alma mater. What was even more exciting was to find out that she too is in the Computer Science program there. And still more amazing, she’s even had a class with one of my former professors. It was so cool to get a chance to catch up first hand on how the university has changed recently and what’s going on there. Tonight I was also fortunate to run into not one but two young authors. A young man and a young lady. Both of them had very interesting stories to tell and I hope that they eventually get the chance to share them with the world. I cannot stress enough how much I enjoy meeting other authors, especially ones that have just started this journey for the first time. I was able to enjoy some extended conversations with them about the stories and their progress. The winner for the night to the answer, “What types of books do you like to read?” was the young lady that answered with “Poetry”. I don’t know why that surprised me coming from a young lady, but you don’t hear young people expressing a interest in poetry very often. Thank you again to all of you who stopped by today. 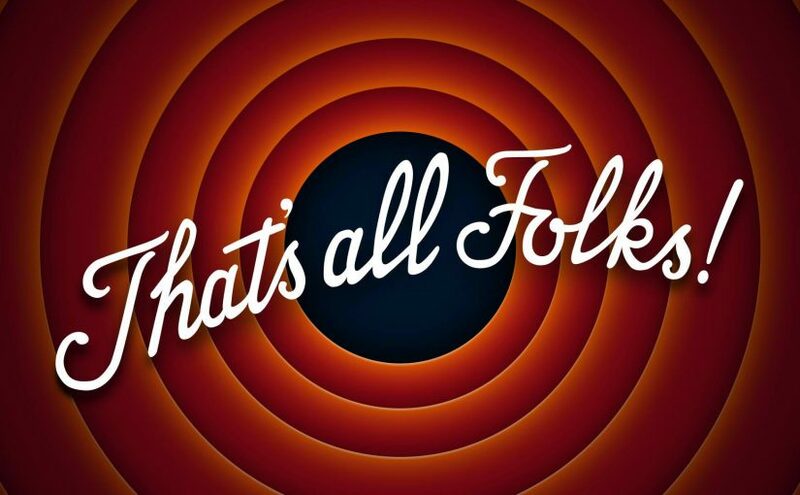 It was indeed my pleasure to talk with all of you. Those of you that made a purchase, I truly hope you enjoy my stories, and I look forward to hearing back from you regarding your experiences. My bed is calling me. I must obey. Must sleep. Fingers . . . are . . . slow—–ing down. Zzzzzzzzzzzzz. Tonight’s fair event had many exciting encounters. First of all, there was no rain. YEAH! Rain has a tendency to dampen turn out, get it rain . . . dampen, that’s right, I’ll be here all week. Don’t forget to tip your server. If you’re in the Information Technology field, what is Server Tipping. Is that kind of like cow tipping? Most of the joking aside, we had a better turn out than the previous two nights. One encounter involved a mom who is currently working on her own children’s book. It was very exciting to talk to her about what progress she has made on her project and what all still needs to be done. As I mentioned in the previous update, I find it both encouraging and exciting to hear other aspiring author’s stories and journeys down the road of publishing. I’ve gotten some of the most interesting answers to the question, “Do you like to read?” Or the alternate ice breaker, “Do you know any readers?” Generally, the answer is either a solid “Yes” or “No”, but sometimes you get some very unique answers. The funniest response to the follow up question, “What types (genre) of books do you like to read?” came from a young lady who indicated that she liked all kinds of books, but that fantasy fiction (essentially what I classify the Silverwood Chronicles as) was on the absolute bottom of the list. She even went so far as to tell me that if she ever found a genre that she liked less than fantasy fiction, she would make sure to come back around and give “Guardian of the Silverwood” a try. We had a good laugh together. My booth partner and I also had an encounter with a self-ascribed Atheist. The conversation was very cordial and he was very encouraging to both of us even knowing that the world view from which both of us write is more Christian than secular. He was interested in “Guardian”, but prefers his books as audio books. He is not alone. I know there is a growing market for audio books for “people on the go”, so I may have to look on more time at the possibility of producing an audio version. We met so many nice and encouraging people tonight that this post would go on for an hour and I’m already so exhausted I can barely keep my eyes open. 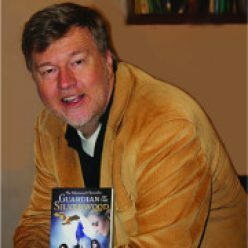 My biggest fear is that I didn’t take in the “Book 1” effect of “Guardian of the Silverwood”. By that I mean when we planned our order for this event, I tried to balance out the order. This I now know was a mistake. I should have ordered twice as many of book one as I did of “A Spy in Nightfall” because of the “try it” factor. Oh well, you live and learn; hopefully. Good night. Blessings to all. I hope to see some of you at the fair tomorrow between 2pm and 10pm. After two days at the Johnson County Fair I can honestly say I’ve had the opportunity to meet a wide variety of people. Book sales have not been what I’d hoped them to be, but the experience in meeting some of these wonderful people certainly helps make up for it. For example, two young ladies stopped by the booth. One of them is herself an aspiring writer. I got a chance to hear about a story she’s working which sounds very exciting. She did purchase a book, but more importantly, I hope I was able to encourage her to continue writing. A second example was when another young lady and her family stopped by. I introduced her to Chel & Riley and I immediately knew something was different but I couldn’t put my finger on it. After my booth partner started talking about his book it was then that I realized the mom was deaf and the daughter was translating for her. That moment was very special because I saw in that little girl’s eyes a love for her mom. She was extremely patient with us in communicating our stories to her mother and we hope to see them back later this week. I also got to meet some old friends, Warner & Tiffany, Craig & Virginia, Daryl, and Chad. I hope to see more of you this week. I’d love to say “Hi” and see how you’re doing. I must say that I’m getting very excited about the Johnson County Fair, July 17-23. This will be my first fair promotion which I hope allows me to introduce my writing to a slew of new readers. Marketing materials have been ordered: two-sided bookmarks, business cards and a 2 x 6 foot banner. I have a reasonable supply of books to sign, but I can’t help but second guess if it is enough. I’m sure my book sales consultant would tell me to order more, but there’s always the website. We are still working on final pricing and promotions. If you’re in the area, stop by. I’ll be in the booth every afternoon and evening till close. Kathryn — my creative consultant and all around inspiration — will be there in the mornings when she isn’t at basketball camp. If you won’t be able to stop by, please tell someone you know — preferably someone who enjoys reading — in the Franklin / Johnson County area to come say “Hi” for you. With all this focus on the fair, progress on book three has been slow. Chapter six is finally complete and it ended up at nearly 6,500 words, which is one of the largest chapters I’ve written to date. There is just a lot of ground to cover, but maybe I can find a way during revisions to reduce it some. I’ve been listening to my readers and critics and I’m trying to add more details to each scene and still not bog the story down. I’m starting Chapter 7 today, and hopefully I will be able to get into a groove over the next couple of weeks and start cranking out some serious . . . insert appropriate synonym for words. It won’t be long before I’ll have to start thinking about cover designs. I’ve also considered including some lead-in artwork on each chapter. That will probably happen if I have enough content, but that’s going to have to come from outside of these fingers as I cannot hardly draw a straight line with a ruler. I look forward to seeing some of you soon. Until then, keep reading and keep dreaming.